As I was preparing to head out this morning for Champaign, via Clinton, got a call from Terri warning me about extreme weather. The news was reporting wind gusts of up to 80 mph for the region (several semis had already been knocked over) and tornado warnings and watches were in effect. No way I was going to chance that and risk shooting through the air like a real rocket. Very disappointed, though, as I had really wanted to present on a panel tomorrow at the University of Illinois’ Sustainability Week. 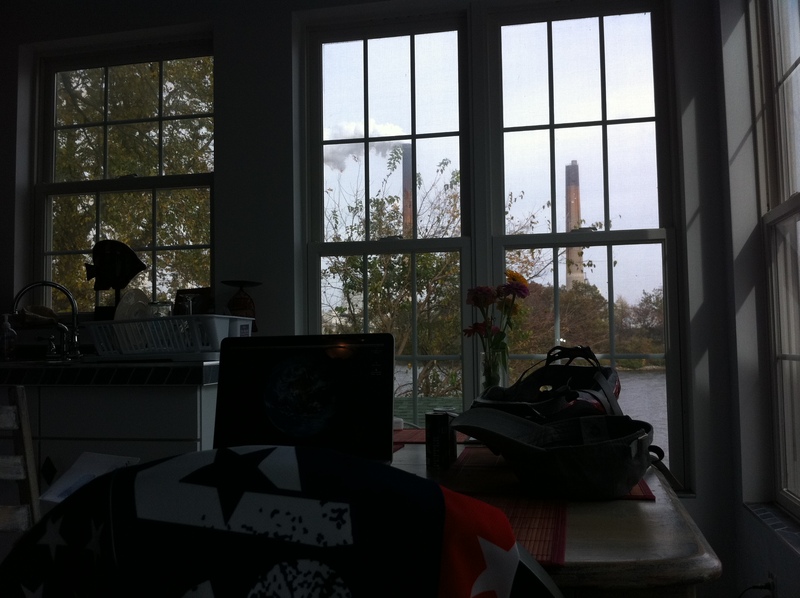 So emailed my regrets and got to work updating my website from my room with a view of a coal plant. Matt Childress, however, was determined to get me there, and started scheming with colleagues on how to transport me to Champaign in a way that would maintain the integrity of my ride. Turns out one of the other panel speakers lives in Springfield and owns an electric car, which he is offering to use to tow me and my trike over to the university in the morning. What a great analogy for moving forward as a nation: by working together and being creative, we can always find a way. Sarah Phillips Eccles and her 6-month old daughter Ursula from next door stopped by to offer me breakfast(!). She and her husband Randy had been working the local radio stations on my behalf, which led to a couple of interviews, including with Springfield-based WTAX. Sarah later dropped off some homemade cookies, and shared with me a heartfelt blog she wrote (below). Thanks for everything, guys! Got a call tonight from Matt’s buddy, Kevin Smith, asking about the dimensions of my trike, so he could rig up a special trailer for it (a project that kept him up until 2am). Just before calling it a night, saw an AP article from my friend Paul Alexander on today’s “massive windstorm,” saying “the unusual system mesmerized meteorologists because of its size and because it had barometric pressure similar to a Category 3 hurricane, but with much less destructive power.” Really glad I hunkered down through that. It meant not being able to swing by the Clinton nuclear power plant, which I had hoped to profile tomorrow, but there should be others. This entry was posted in 2010 Ride, Articles, Blog and tagged coal plant, illuminati motor works, ride for renewables, seven, wtax. Bookmark the permalink.